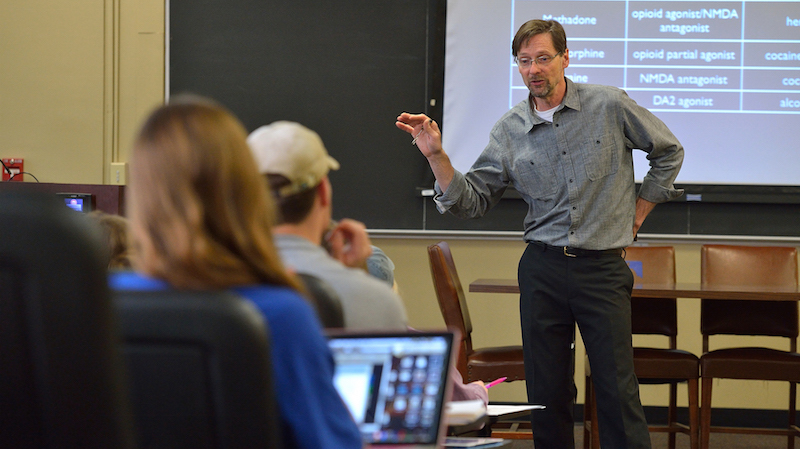 Psychology Educator Received Prestigious Honor in Washington, D.C.
A respected University of Mississippi teacher and researcher is this year’s Carnegie Foundation for the Advancement of Teaching-Council for Advancement and Support of Education Mississippi Professor of the Year. Kenneth J. “Ken” Sufka, professor of psychology and pharmacology, received the prestigious honor Thursday (Nov. 20) at the U.S. Professor of the Year Awards celebration in Washington, D.C. The program salutes the country’s most outstanding undergraduate instructors and is the only national effort to recognize excellence in undergraduate teaching and mentoring. In addition to an all-expenses-paid trip, Sufka got a framed certificate of recognition. Winners were also recognized at a congressional reception and have opportunities to participate in media interviews, speaking engagements, teaching forums and other events. The university shares Sufka’s recognition, UM administrators said. Douglass Sullivan-Gonzalez, dean of UM’s Sally McDonnell Barksdale Honors College, said Sufka sets the bar for excellent teaching and creative scholarship among students and colleagues. Sufka is most deserving of the award, said Michael T. Allen, chair and professor of psychology. Sufka earned his bacheor’s, master’s and doctoral degrees from Iowa State University. Before joining the UM faculty in 1992, he conducted research at Drake University, Des Moines University and Duke University. Sufka is a visiting research fellow at Newcastle University and an associate member of the UM Medical Center’s Cancer Institute. Sufka said he is following in the footsteps of professors who taught and mentored him. Sufka teaches several courses at UM, including General Psychology, Biopsychology, Psychopharmacology lab, Physiological Psychology and Teaching of Psychology seminar. A campus favorite among students and faculty alike, he has received the 1996 Elsie M. Hood Outstanding Teacher Award, the 2005 Faculty Achievement Award and the 2006 Thomas F. Frist Student Service Award. His other awards and honors include Top 20 Psychology Professor in Mississippi, Distinguished Alumni Award from ISU’s Department of Psychology, Presidential Citation from the American Psychological Association and Top 40 Under 40 Mississippian. Sufka holds professional memberships in the Society for Neuroscience and the Society for the Teaching of Psychology. With research interests in behavioral neuroscience and psychopharmacology, he has written more than 67 refereed papers, 10 book chapters and one book, “The A Game: Nine Steps to Better Grades” (Nautilus Publishing, 2011). Many colleges and universities across the U.S. have used Sufka’s book for specific programs. Sufka has been the principal investigator on grants and contracts totaling more than $660,000. A prolific author, he has presented more than 120 conference papers and abstracts. Sufka has directed 12 master’s theses and eight doctoral dissertations. He is a regularly invited speaker at freshman summer orientation sessions and helped develop the initial Sally McDonnell Barksdale Honors College curriculum. He also volunteers with the Oxford-Lafayette County Habitat for Humanity. CASE launched the awards program in 1981. That same year, the Carnegie Foundation began hosting the final round of judging, and in 1982 became the primary sponsor. For more about the U.S. Professor of the Year Awards program, visit http://www.usprofessorsoftheyear.org.